Like many homeowners, Playmor owners realize they can add to the value of their unit by having maintenance performed on their home. Sometimes they hire a contractor, sometimes they do it themselves. The purpose of this page is to share information about projects that You can do, or have done, that will add to the safety, comfort and value of your home as well as to Protect your Investment. Installing a low flow shower head is a great way to conserve water. Most homeowners can do it by themselves. However, there is a caution. Several leaks have resulted inside the shower wall when residents have changed shower heads. Remember that you are responsible for any damage you cause to your unit or adjacent homes. Change the feeder pipe sticking out of the shower wall. Wrap the threads snugly, 4 or 5 times around, with white plumber’s tape. Ensure the wrapped feeder pipe is firmly cinched inside the shower wall. Don’t back off! If you have to loosen the pipe, you may have have broken the watertight seal. Completely remove the feeder pipe, remove the plumbers tape, and reapply. Although replacing a shower head is an easy upgrade for most residents, remember that even a small movement to the feeder pipe may loosen the connection inside the wall, causing a damaging slow leak. There are two types of smoke detectors: Ionization and Photoelectric . Each type of sensor has very significant advantages and disadvantages. Experts recommend you install both types of detector, or dual detection units, for maximum safety. Uses a small amount of radioactive material to sniff out fire. Reacts quickly to fast-flaming fires, such as paper or flammable fluid. These may not produce much smoke. Reacts slowly to smoky, slow-starting fires such as smoldering fires in bedding and upholstery, or some electrical fires. Uses a light beam to detect smoke particles in the air. Reacts quickly to smoky, slow-starting fires such as smoldering fires in bedding and upholstery, or some electrical fires. Reacts slowly to fast-flaming fires that may not produce much visible smoke. These have both an ionization sensor and a photoelectric sensor built into a single unit. Dual Detection units have the advantages of both. Consider installing both types of detectors, or dual detection units, throughout your home to ensure maximum safety. Remember that smoke detectors are usually designed to last for ten years. If you are still relying on the hard-wired smoke detector that was originally installed when your unit was built, you may be at risk. Battery operated smoke detectors may easily be installed by anyone. Replacing your hard-wired detector will require a ladder, screwdriver, and some electrical knowledge. You must also be able to turn off the circuit breaker that powers your hard-wired smoke detector. A water heater leak tray is a simple plastic or metal “bowl” with a flat bottom and edges about four inches high. It fits directly underneath your water heater. One of the edges has a connector for one inch PVC pipe. The purpose of the water heater leak tray is to (a) catch any water that leaks out of your water heater and (b) route it through PVC pipe to a safe location. One of the most certain things about home ownership is that someday your water heater will have to be replaced. A common first indication of this is when the tank begins to leak. Typical water heaters hold about forty gallons of water, which would be quite a mess and potentially cause considerable damage if it wound up on your floor as well as that of your neighbor. Worse, remember that your water heater is continually being refilled, so a leak could continue indefinitely. Stopping water from flowing into a leaking heater tank is easy. 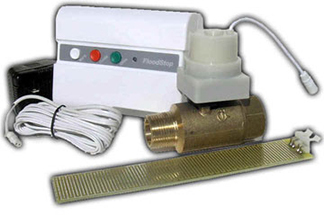 Invest in a water leak detector designed specifically for your water heater. These use a sensor on the floor near the tank that signal the presence of leaking water. This signal goes to a control unit that shuts off more water flowing into the water tank. 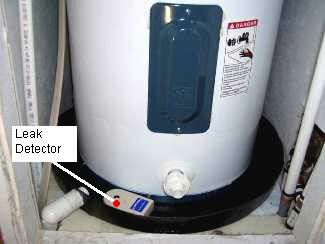 With a water leak detector, a leaking tank would not be continually refilled. This would limit your leak to the forty gallons in the tank. Forty gallons is still a major mess that can cause damage to your as well as adjoining units. What can you do to prevent this? Installing the water heater leak tray is extremely easy if you do it while the water heater is being replaced. Installing the PVC pipe is within the capabilities of most handy homeowners. Draining the pipe varies by where your water heater is located. If your water heater is inside the garage, a safe location to drain leaking water would be near the garage door. This would minimize damage to all buildings. Remember that a water leak detector would still save you the cost of heating a lot of drained water. If your water heater is inside your utility room, draining becomes more of a challenge. Draining outside is the safest option, but you will have to arrange for the PVC pipe to be routed through the wall in your laundry room. After the drain pipe is routed through the new hole in your wall, the hole will have to be patched and the stucco repaired and painted outside. This would also require submitting an architectural change request to the Board of Directors for approval before the work has begun. The HOA Board appreciates the benefit of installing a water heater drip tray and is prepared to work with homeowners to assist in getting this done. Insurance companies tell us that a common cause of damage to homes is a water leak. Most often these come from a burst washer hose, a leaking water heater, a leaking ice maker supply line or an overflowing toilet. If this happens, you will be responsible for damage to your and your neighbor’s home. One no-cost way of reducing risk is to turn off the water supply to your washer, toilets and ice maker when you are away from home. 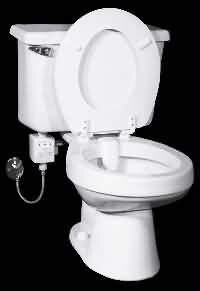 This is effective but it is inconvenient and it provides no protection when the water valves are on. Caution: turning off your ice maker water supply for a long time may damage your refrigerator’s ice maker. Do not turn off water to your water heater. Water Alarms can signal a warning if they detect a leak, but they will do nothing to stop it. Some owners have installed whole-house water leak protection. Sensors in key areas shut off all water throughout the house when a leak is detected. Although effective, this would require substantial plumbing modifications for most units. A more practical way for most owners to greatly reduce the risk of damage is to install several water leak detectors. 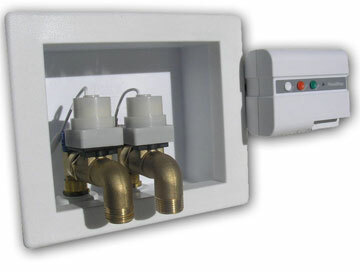 These use a control unit near the water supply, a valve on the water inlet and a sensor on the floor to detect water. If the sensor gets wet, it shuts off incoming water to the individual washer, water heater, ice maker or toilet. Most will also activate an alarm. Homeowners who have every had a hose burst, water heater leak, toilet overflow or ice maker leak can fully appreciate the benefits of water leak detector. These units are likely to pay for themselves immediately in the event of a leak. Water leak detectors are relatively easy to install by homeowners without professional assistance. The only tools required are a wrench and pipe tape. Detectors may be available in hardware stores or can be purchased online by searching for terms such as water heater leak detector, washer leak detector, ice maker leak detector or toilet leak detector. 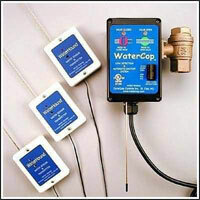 Examples of a water heater leak detector, a washer leak detector, a toilet detector and a whole house water leak detector are shown below. The Playmor Bernardo Board of Directors does not specifically endorse any of these products, but we do recommend you consider installing protective devices similar to the ones seen below. Anything in the home that burns a fossil fuel can create carbon monoxide–a colorless, odorless gas that can be lethal. As a result, carbon monoxide detectors are now required in every dwelling unit where the home has a gas burning furnace, cook stove, water heater, fireplace, wood burning stove, or attached garage (auto exhaust). Installation Deadline.Single-family homes must install them by no later than July 1, 2011. Condominiums and townhomes must install them by no later than January 1, 2013. The requirements are found in Health & Safety Code §§17296, 17926.1, and 17926.2. For more information, see Senate Bill 183.